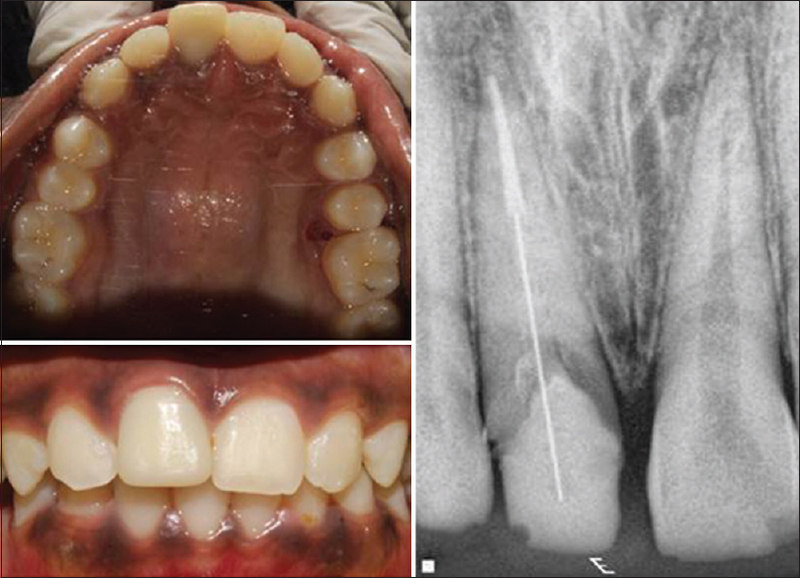 This case report describes the management of complicated crown-root fracture by endodontic treatment, orthodontic root extrusion, and esthetic restoration using polycarbonate crown in a 12-year-old male patient. A 12-year-old boy reported to the Department of Paedodontics and Preventive Dentistry, Terna Dental College with the chief complaint of broken upper front tooth. The patient had a history of trauma to the anterior teeth 5 days ago due to fall while playing. The medical history was not significant and the findings of the extraoral examination were unremarkable. Intraoral examination revealed a complicated crown-root fracture in the maxillary right central incisor with a mobile tooth fragment that extended subgingivally in the palatal region [Figure 1]. Radiographic examination using intraoral periapical radiograph confirmed the findings of the clinical examination; the fracture line on the palatal side could be traced 2 mm below the alveolar crest. Closed apex was present with maxillary right central incisor. The periodontal space around the tooth appeared to be normal, and there were no pathologic findings in adjacent teeth [Figure 2]. Figure 1: Preoperative intraoral photograph showing complicated crownroot fracture with right maxillary central incisor. Figure 2: Preoperative intraoral periapical radiograph showing radiolucent line seen below cementoenamel junction. On the basis of clinical and radiographic findings, a diagnosis of complicated crown-root oblique fracture, Andreasen's classification 502.54 was made. A definitive treatment plan was made as follows: removal of fractured fragment under local anesthesia followed by endodontic therapy of residual tooth. Following this, orthodontic extrusion to move the fracture line 3 mm above the alveolar crest was planned to regain the lost biologic width. The treatment option was explained to the parents and consent was obtained for the treatment. Anesthesia was established by local infiltration of lidocaine with 1:80,000 adrenaline. After removal of the loose fragment, the tooth margin was clinically visible on the labial side but not on the palatal side. Probing with a periodontal probe revealed that the tooth margin on the palatal side was located subgingivally and below the alveolar crest level. Root canal treatment was initiated. After preparing an endodontic access cavity, the root canal working length was determined to be 20 mm with a periapical radiograph. The canal was prepared using ProTaper® rotary instruments (Dentsply-Maillefer, Switzerland) till F2. 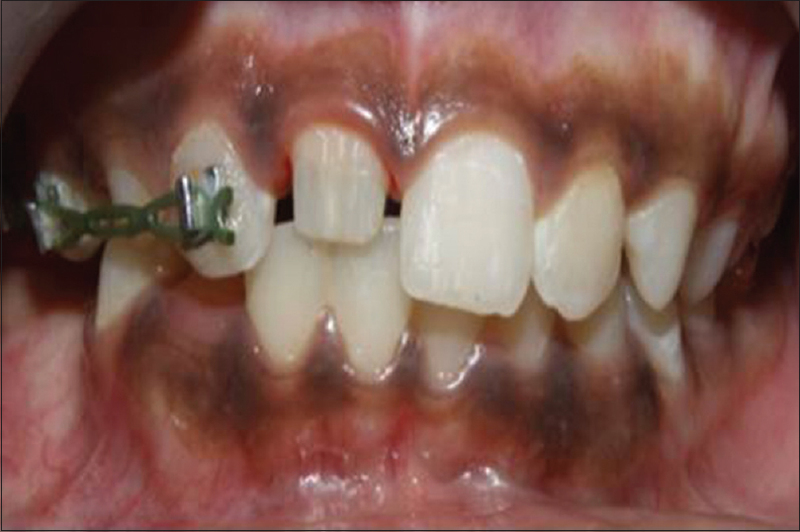 After the canal preparation, F2 size gutta-percha cone was lightly coated with an epoxy resin-based sealer (AH Plus Jet, DentsplyDeTrey, Konstanz, Germany) and the root canal treatment was completed [Figure 3]. Figure 3: Root canal treatment with 11 done with rotary ProTaper files followed by postspace preparation. Post space was prepared with the help of Peeso reamer size 3 (Mani, INC, Japan) [Figure 3]. A “J” shaped post hook was prepared using 19-gauge stainless steel wire and cemented with glass ionomer cement. 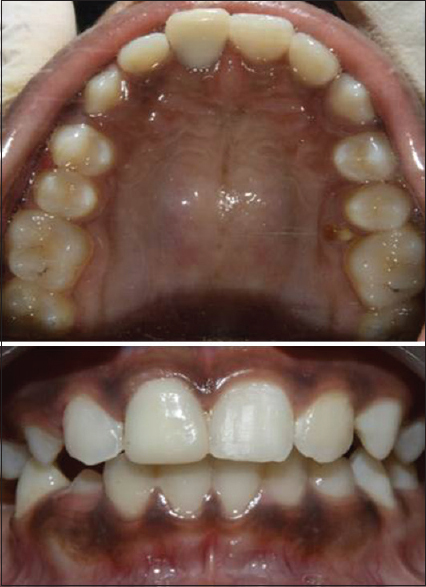 Brackets were placed on maxillary right lateral incisor and left central incisor. Extrusion was activated by elastic which was attached to the brackets and “J” hook. Within a span of 2 weeks, 1 mm extrusion was observed [Figure 4]. However, 1 mm mesial tipping of maxillary right lateral incisor was also observed. Hence, brackets were also placed on both right maxillary premolars, and E chain was placed to reposition the right lateral incisor [Figure 5]. Within 4 weeks, the desirable 3 mm extrusion was observed along with repositioning of the right lateral incisor. The brackets and J hook were then debonded [Figure 5]. Figure 4: Intracanal J hook placement and brackets placement. Figure 5: Distalization of right lateral incisor. Glass fiber post (Reforpost, Angelus® Ind. e Com Ltda. Londrina, PR, Brazil) was placed into the root canal for supporting the coronal fragment. Size 2 glass fiber post (Reforpost, Angelus® Ind. e Com Ltda. Londrina, PR, Brazil) with a 1.4 mm diameter was placed at the length of 12 mm and was luted. After cutting the excessive post, core buildup was done using composite resin (SDI, Australia) [Figure 6]. Tooth preparation was done to receive polycarbonate crown. Following tooth preparation and necessary adjustments in the crown, the polycarbonate crown was cemented using luting glass ionomer cement and postoperative radiograph was taken (Fuji 1, GC Europe) [Figure 7]. Figure 6: Core buildup and tooth preparation. Figure 7: Postoperative photograph and radiograph following cementation of polycarbonate crown. For cases of complicated crown-root fractures, there are several proposed treatment options including a mucogingival flap, an osteotomy/osteoplasty, and orthodontic or surgical extrusion followed by the reattachment of the original fragment. Another option includes the restoration of the tooth crown with a restorative material or prosthetic rehabilitation of the tooth depending on the location of the fracture line.,, Extraction is also an option followed by tooth replacement. Orthodontic extrusion of a fractured tooth maintains the periodontal tissues at the same level and restores physiological attachment. A 3–4 mm distance from the alveolar crest to the coronal extension of the remaining tooth structure has been recommended for optimal periodontal health. The forced eruption should be maximum 5 mm according to Ingle and was limited to 3 mm in the present case. 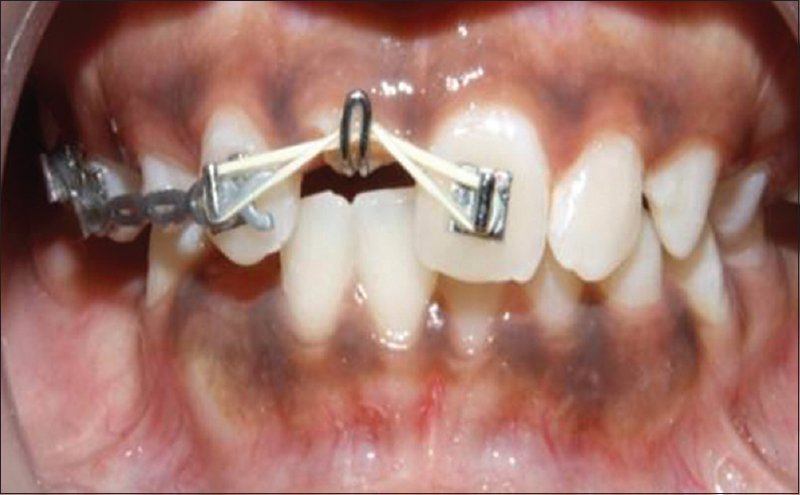 Orthodontic extrusion leads to supragingival positioning of the fracture line. To reinforce the cervical portion of the tooth to receive a coronal restoration, it is recommended to use an intracanal post. The post also minimizes the stresses. It has been suggested that the use of a long, thin fiber post is effective for reducing the tensile stress that can lead to tooth root fractures of the anterior teeth with endodontic treatments. In the present case, the fracture line was extending subgingivally, and the tooth required root canal treatment. Hence, it was decided to gain intraradicular retention using fiber posts. At 6-month follow-up, patient was asymptomatic. Clinical evaluation revealed 0.5 mm apical migration of gingival margin and incisal edge of 11. However, there was no tooth mobility or periodontal pocket formation. Radiographic evaluation at 6 months revealed no abnormality [Figure 8]. Figure 8: Six-month follow-up photograph and radiograph. Long-term follow-up of the present case is needed to ascertain the long-term clinical success based on clinical and radiographic examinations. Crown-root fractures localized in the anterior region need to be evaluated from several perspectives including tooth vitality, tissues involved, fracture location, and the quantity of remaining tooth structure. In the present case, a tooth with complicated crown-root fracture was successfully managed by endodontic therapy, orthodontic extrusion, fiber post placement, core build-up with composite, and esthetic restoration using polycarbonate crown. Long-term follow-up is required to evaluate the long-term clinical success of the case. Andreasen JO, Andreasen FM. Textbook and Color Atlas of Traumatic Injuries to the Teeth. 4th ed. Oxford: Blackwell; 2007. Turgut MD, Gönül N, Altay N. Multiple complicated crown-root fracture of a permanent incisor. Dent Traumatol 2004;20:288-92. Cortes MI, Marcenes W, Sheiham A. Impact of traumatic injuries to the permanent teeth on the oral health-related quality of life in 12-14-year-old children. Community Dent Oral Epidemiol 2002;30:193-8. Lee JY, Divaris K. Hidden consequences of dental trauma: The social and psychological effects. Pediatr Dent 2009;31:96-101. Andreasen FM. 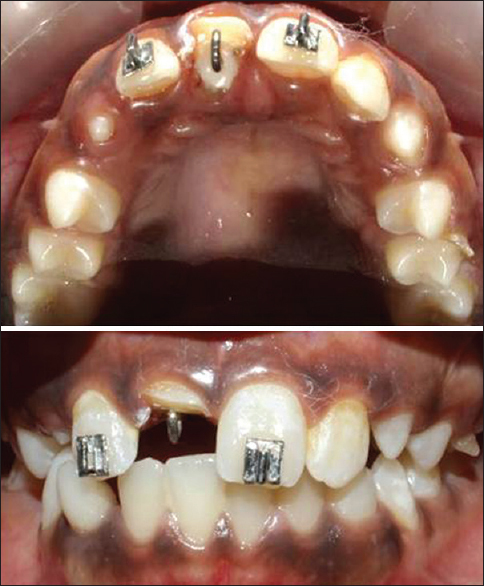 Reattachment of subgingivally fractured central incisor with an open apex. Dent Traumatol 2007;23:263. Castro JC, Poi WR, Manfrin TM, Zina LG. Analysis of the crown fractures and crown-root fractures due to dental trauma assisted by the integrated clinic from 1992 to 2002. Dent Traumatol 2005;21:121-6.
de Castro MA, Poi WR, de Castro JC, Panzarini SR, Sonoda CK, Trevisan CL, et al. Crown and crown-root fractures: An evaluation of the treatment plans for management proposed by 154 specialists in restorative dentistry. Dent Traumatol 2010;26:236-42. 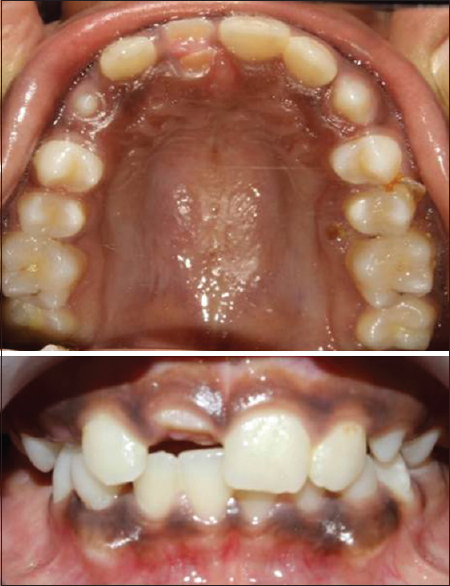 Nandlal B, Daneswari V. Restoring biological width in crown-root fracture: A periodontal concern. J Indian Soc Pedod Prev Dent. 2007; 25 (Suppl): S20-4. Poi WR, Cardoso Lde C, de Castro JC, Cintra LT, Gulinelli JL, de Lazari JA, et al. Multidisciplinary treatment approach for crown fracture and crown-root fracture – A case report. Dent Traumatol 2007;23:51-5. Emerich-Poplatek K, Sawicki L, Bodal M, Adamowicz-Klepalska B. 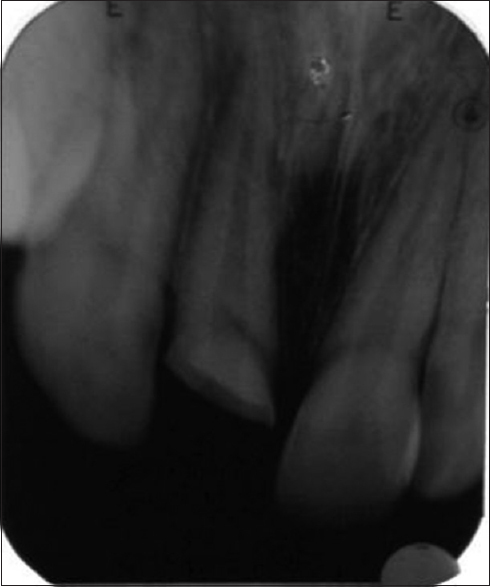 Forced eruption after crown/root fracture with a simple and aesthetic method using the fractured crown. Dent Traumatol 2005;21:165-9. Kocadereli I, Tasman F, Guner SB. Combined endodontic-orthodontic and prosthodontic treatment of fractured teeth. Case the tooth was in new corrected position report. Aust Dent J 1998;43:28-31. Ingle JI, Bakland LK. Endodontics. 5th ed. Hamilton (ON): BC Decker, 2002. Kumar A, Jyothi KN. Reattachment of fractured tooth using self etching adhesive and esthetic fiber post. J Dent Sci Res 2010;1:75-83. Nakamura T, Ohyama T, Waki T, Kinuta S, Wakabayashi K, Mutobe Y, et al. Stress analysis of endodontically treated anterior teeth restored with different types of post material. Dent Mater J 2006;25:145-50.